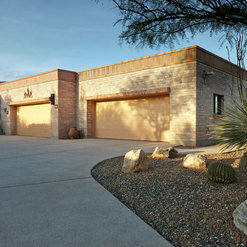 3227 N Palo Verde Ave. Typical fees range depending on services being provided. 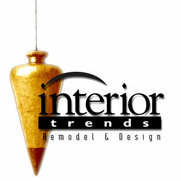 Interior Trends Remodel & Design provides clients premier design & build services from concept to completion. Offering full-service residential remodeling of kitchens, bathrooms, home offices, outdoor living, additions, and other residential building needs. Providing turnkey services, integrating the in-house expertise of professional interior designers and licensed builder on projects both large and small. Complementing How You Live! The Kathys took our ideas and made them into realty…We loved that! Working with them throughout the design process and bringing it all together was seamless. We are from this industry and have seen the good, bad, and ugly. 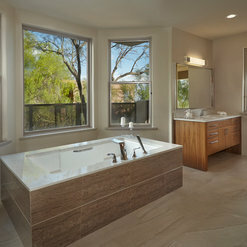 We have built homes and been through many remodeling projects. We thought we knew what we wanted and The Kathys had great ideas and introduced new concepts that really elevated the overall design. They kept us in the loop with no secrets. The kitchen is huge hit! We cannot say enough great things about it. The whole Interior Trends Remodel & Design team was such a pleasure to work with, the workmanship was quality. Once we spent time with The Kathys, we were no longer nervous about the remodel. The Kathys were great and they took all the fear out of the experience. This was fantastic! Well I have finally had the time to write this review. Sorry lady's for taking so long. My wife and I had decide to purchase our retirement home on a trip to AZ. in 2014. We found the right house for us and we also found the right contractor for the job. Kathy and Kathy we the right fit for us. Kathy Lyle hit the nail on the head with great design and Kathy Nieto as the builder handled the project exceptionally well. As a person who works in the building trades I am skeptical of all contractors and had my doubts about the 6 contractors we interviewed during the process of selecting our GC for this project. We were not disappointed in hiring Interior Trends. Professional,Detail and most of all paid attention to what we requested. These 2 ladies and their staff where great to work with and went above and beyond our expectations. Kathy Lyle is a very good designer, and Kathy Nieto is a very good builder who does it the right way and not the cheapest way. If you looking for quality and great design hire this organization and their team. You will NOT be disappointed. I look forward to future projects with them. From first contact to the end of our project, The Kathys and their crew were amazing. 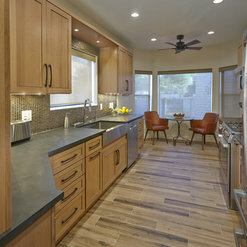 They had wonderful, workable ideas for our remodel, and provided excellent service. Their crews were on time, efficient, professional and cleaned up daily. They were cheerful, friendly and answered any and all of our questions. Plus, they incorporated any changes we wanted (upgrades, color, finishes etc. )without batting an eye. I would give them ten stars if I could - they have my highest recommendation. We couldn’t be happier! 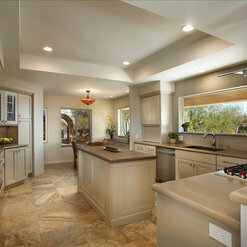 – Interior Trends Remodel & Design did an excellent job! I was very impressed with The Kathys. Kathy Nieto was very good at explaining the process, and could not have been more accommodating. Kathy Lyle really listened to what we wanted and the results absolutely met our expectations. The Kathys’ proposal came in on budget AND on time. Throughout the project, the subcontractors were professional, unobtrusive, and kept the construction areas clean. 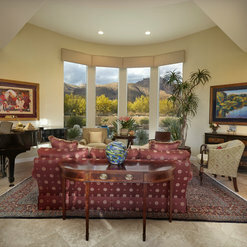 I highly recommend Interior Trends Remodel & Design. Overall – Outstanding! 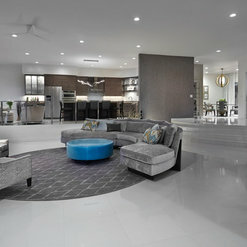 – Sydney & Richard L.
My interior design firm recently had the pleasure of working with Kathy Lyle and Kathy Nieto (affectionately referred to as “The Two Kathys”) of Interior Trends Remodel and Design on a large-scale remodel of a residence in Tucson. We became involved after work had begun and many decisions were already underway. From the start, I was impressed not only by the Two Kathys welcoming, collaborative approach to the project but also their honest, no-nonsense work ethic. Their design plan was spot-on; their work schedule was thoughtfully well-organized; and their staff was personable and attentive. Regardless of what design “curve balls” we threw at them, they handled everything with the utmost professionalism, a typically unseen attention to detail and a healthy dose of common sense, all of which resulted in this project being completed in a timely manner and being beautifully beyond the clients’ expectations. Furthermore, the Two Kathys and their firm do not disappear once the project is complete. Follow-up is excellent, and they remain available for any questions one may have down the road, which is something rarely seen these days. As a result of the experience, hard work, patience, humor and charm they brought to this project, I can honestly say it was one of the best projects my firm has had the honor to work on in a number of years. Having now completed my work with Interior Trends Remodel and Design, I have to commend the Two Kathys and their entire staff not only on their work but also their character. Not often do I have the chance to sincerely note an exceptional job done by exceptional people, but I am happy to say I can do so regarding Interior Trends and Remodel. They come with my highest recommendation. 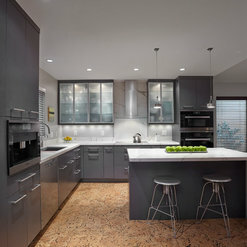 My husband and I have used Interior Trends & Remodel on two projects so far - a condo (bathrooms, kitchen, flooring throughout) and an entire house. The house included bathrooms, kitchen, floors, all new plumbing, electric, heating, water, carport-to-garage conversion, lighting, landscaping, wall around property, etc. It's been a pleasure working with such a great team who are passionate about their profession. We'll be sure to use this team on our next project. Over the past 10 years we have had Interior Trends remodel several areas in our home...total kitchen remodel and 2 total bathroom remodels. Their latest project (listed below by date and cost) was for total wood flooring throughout the entire house, installation of 5 new Impervia windows, battery operated window treatments for those windows, a stained glass window, 2 new Pella doors and 2 screen doors. We have always been extremely pleased with Kathy Lyle, Kathy Nieto and everyone who works for them. One of our remodels was done while we were on vacation. We were confident that if a problem arose, in our absence, we could trust them to make the right decision. They are perfectionist, who make sure everything is done to their standards (and ours). We would highly recommend "The 2 Kathys" to anyone wanting to remodel because they are true professionals. I hired Interior Trends to redo my kitchen. I felt I needed a designer to help with the decisions I needed to make. The Kathys did a wonderful job! I have been in my new kitchen for just slightly over a year, and it is still just a joy to be in, to work in, and to look at. 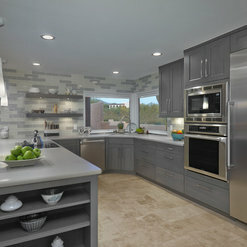 I can't say enough about Kathy Neito & Kathy Lyle of Interior Trends Remodel & Design. Based on positive recommendations of 3 friends in my neighborhood, we hired Kathy & Kathy to upgrade and improve our kitchen, dining room, family room, 3/4 bath and laundry room. The results lived up to everything we dreamed plus more. The work was professional, they handled all the problems inevitable in a 66 year old house with previous additions. We'll be using them again for future projects. We appreciate the kind words & it was a pleasure working with you both. Your kitchen turned out beautiful & so happy to hear you are enjoying it! I love working with "the two Kathys!" They are highly professional, talented, very easy to work, immaculate with and really listen to what you want to create. They have remodeled our bathrooms, living room and recently created an amazing meditation garden. You will love working with them! Thank you Amy, it has been great working with you as well. We had two projects, a townhouse update (carpet, paint,etc.) in addition to a pantry addition with improved kitchen lighting. Both projects went very smoothly and on schedule. Everyone at Interior Trends was very professional and we had no surprises. We are looking forward to using them again for our next project. We have a 30 year old single-family one story home in the foothills that was sorely in need of updating. Our initial plan was to update the kitchen and bathrooms. But we ended up doing a total remodel, walls were removed to open up the kitchen to the living room. We had a 16 foot window wall placed in the living room that opens to the patio. The fireplace was redone. The entire house was painted. New flooring put down, electric updated and new washer/dryer, water heater, heating system and ac placed. 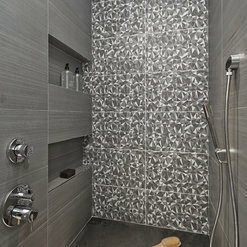 The master bath was totally redone including a wet room for the tub and shower. The team was great in assisting us in design of kitchen, bathrooms and living room and picking out cabinets, flooring, backslash, etc. We were lucky to find such a thorough and meticulous team. We have a new home!! Commented: Finally!Hi. The veneer stone is from Pittsburgh Corning, color is Chardonnay. I believe the product is still available. Thank you for your inquiry. Commented: Are the counter tops laminated?Thank you for your question. 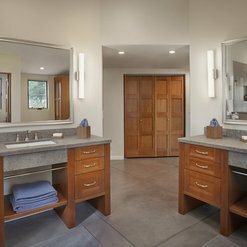 The countertops are Caeserstone #4030 Honed Pebble, they are quartz. Commented: What is the name of the granite color?The granite is Golden Crystal. Thank you for your question. 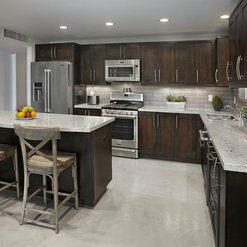 Commented: Could I inquire what door style and color on the cabinets?Thank you for your question. 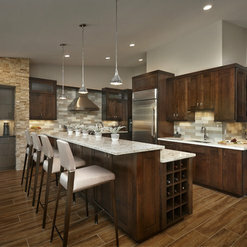 The cabinets are by Amero. Door Style: Mesa. Wood: Cherry. Color: Golden with Mocha Glaze.